At some ungodly hour this morning, still half asleep, I heard my mother’s voice saying, ‘Don’t make a rod for your own back.’ At the time, I was considering the long list of jobs in the vegetable garden for the day ahead. Rod for my back? Yes indeed. In Spring, the garden turns into the dictator of this little kingdom. 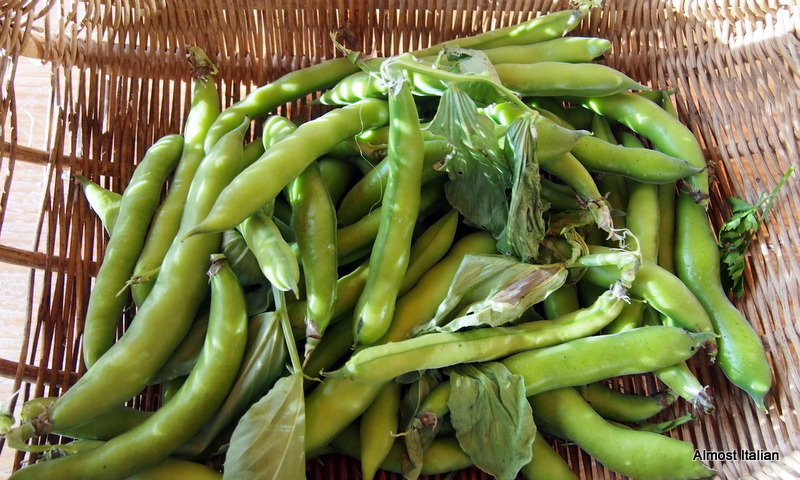 The broad beans must come out today, the potatoes were dug out yesterday, a rather disappointing crop due to frosts in June. All the silver beet plants are now towering over me as they all simultaneously go to seed. They must be dug out and handed over to the chickens, reminding me that next week, the greens will be few in our kitchen. There are lettuces and cucumbers to transplant, more crops to sow, and a piece of metal rio (metal building mesh) would be very handy to make a shady wall for the rhubarb. The fruit trees need netting, the tomato plants staking! Just as one languishes in the land of plenty, along comes that dictator to deliver the rod. Or am I stuck in some bygone land of Catholic penance? Many meals come my way gratis, thanks to l’orto, the veggie garden. This is the upside of our peasant labour, and when I eat this way, I feel that it’s worth all the effort. Last night’s Frittata is an example. I gathered all the ingredients from the garden, added some eggs from our chickens and made a 10 minute meal that was alive with taste, and rather healthy too. 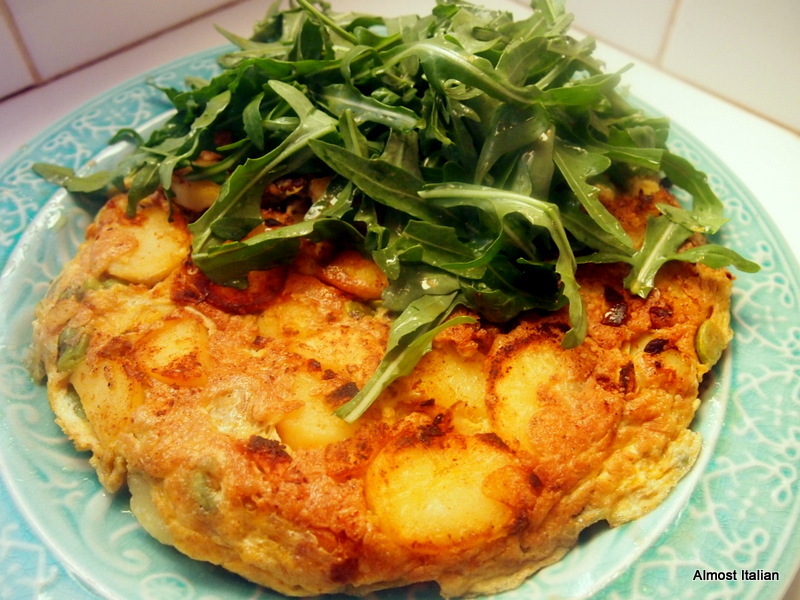 Spring Frittata with Broad Beans, Potato and Rocket. This recipe takes only a few minutes to throw together if you have already cooked and peeled the broad beans, which is discussed previously here. Boil the new potatoes in their skins, until just done. Roughly chop. Heat a small non stick pan and add a good glug of olive oil. Add potatoes, turn around in the oil, add a pinch of salt and the paprika, and cook till golden. 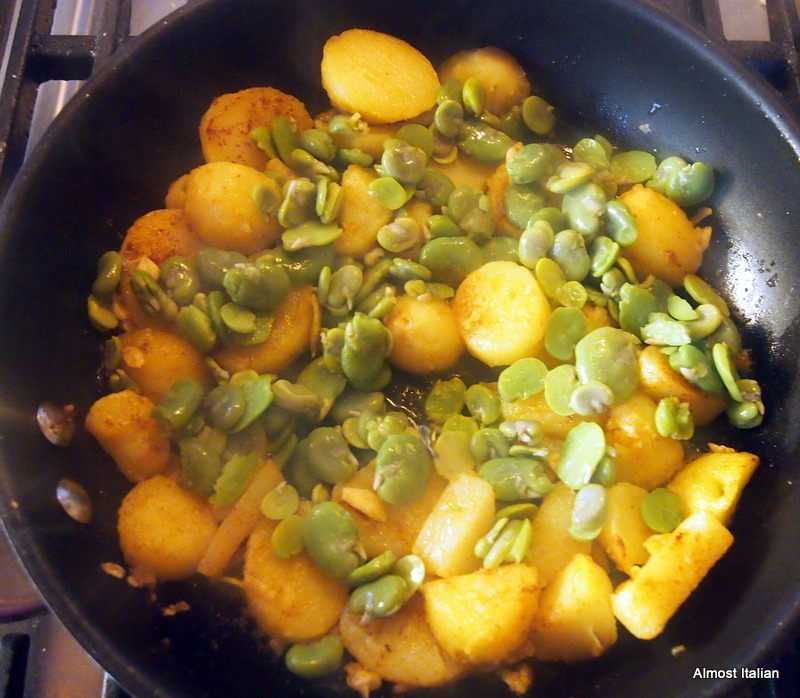 Add the chopped garlic, turn about for a minute, then add the double shelled broad beans. Beat the eggs with a little more salt and pepper, then pour over the vegetables. Lift up the edges of the frittata, allowing the unset egg to run back under, turning the pan as you go. When the frittata looks almost done, except for the wet top, pop it under a hot grill for a minute or so to set. When done, invert onto a plate, using the plate as a lid over the pan. Top with rugola/rocket, which has been dressed in olive oil and sherry vinegar. I go nuts over my garden produce. What a difference in taste! I, too, love to eat this way. Your frittata recipe looks delicious. Thanks, it is fast and easy. You’re on a broadbean bender! Love this one, definitely trying it for the Marito. Tuo Marito will love this one. It is true- the Fave have taken over, but wait- the zucchini are on their way. Your garden really is your master but what gorgeous gifts it bestows upon you. This frittata looks delish, I can almost taste those potatoes. The new potatos were so yummy, sad there are so few this year. Oh my gosh does that look delicious! It was – the little rugola topping added to the overall healthy side. Frittata is one of our favourite dinners, that you’ve grown it all yourself is wonderful… I’m a little daunted by just how much work goes into a truly productive garden. Simply dressed rocket is the best accompaniment. I may have to leave this garden one day. I’m not ready yet, but must prepare for the inevitable, at least mentally and spiritually. Here’s another wise(?) saying: no gain without pain. I think your wonderful kitchen creations might be worth the effort in the garden. It’s a good work-out, too! 😉 Great frittata! Better than paying gym fees. 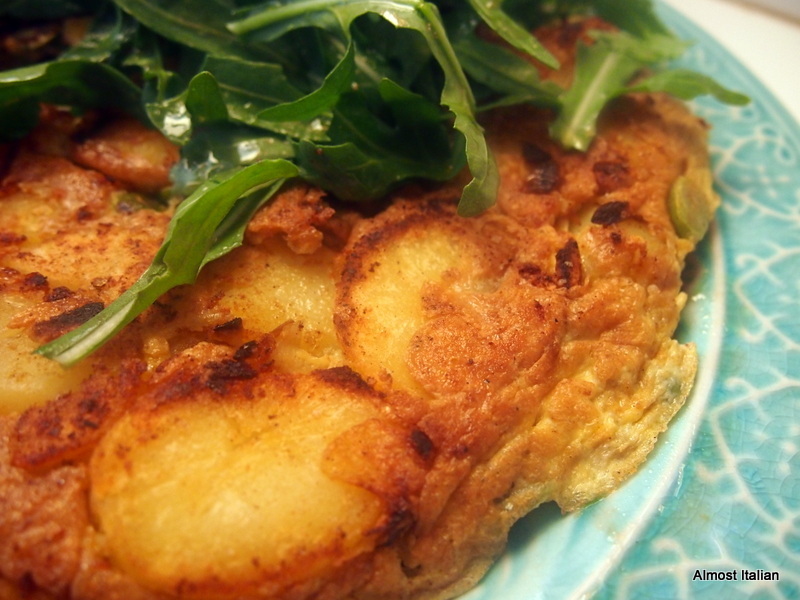 Frittata is a fave in our house, especially when potatoes are included. I’ll go with the no pain, no gain adage!! Ah yes, must remember no pain no gain, better than the one about beating yourself up! Sounds like you have much happening in the garden 🙂 I also feed my chooks the spinach when it is time to haul it out. Love this recipe .. Yum, am a fan of rocket and broadbeans. Thanks Francesca! Don’t the eggs taste and look great after the chooks have had a big feed of spinach and other greens. My ladies and one fluffy gentleman love rocket too.